Wildland fire fighting is a complex and laborious activity, influenced by a lot of of variables that cannot be compared to any other activity, which exposes workers to many risks, some of which are determined by the intrinsic characteristics of the environment itself. Fighting against forest fires you must pay attention to the conformation of the land and the characteristics of the forest road, in order to choose PPE, equipment and methodologies suitable for the work to be done in that environment, to plan the best operations and protect the safety of employees. Approximately 60% of injuries see the fall of stems, trunks and branches as the cause of the damage; 30% is due to cuts made by chainsaw or other tools and remaining 10% to falls caused by difficult ground conditions. But it is above all gravity that characterizes wildland fire fighting activities. In fact, 10% of accidents cause permanent damage or, in the most serious cases, deaths. 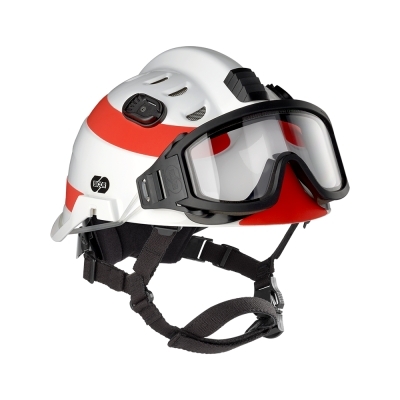 Considering these data, Sicor has designed the best protection system for the head in wildland fire fighting, technical, alpine and river rescue.